I apologize for not posting an entry for so long. Between TKGA's transition to a stand-alone non-profit, working on the first digital issue of Cast On and the holidays, I just didn't get to it. I'm now back to my once every two week schedule. I'm now working on the Spring issue. The Call for Designs is out now. If you are interested in submitting a design go to TKGA.org and select the Publications tab. You'll find information there on submitting a design. As part of the reorganization, we have changed the way students get the materials. As soon as a course is ordered, the student receives a confirmation email with the files attached. However, if someone purchases more than one course at the same time, only one course will be sent. Order them separately. I prefer the new system as students get the materials immediately. In the past, they wouldn't get them until I received notice from Offingers and then I would send the materials. Another self-serving topic! My new MiniCourse will be available in January and I spent this early part of this week writing it. The title is Fair Isle Flat. It really should be called Stranded Knitting Flat but that doesn't sound as good. I really resisted developing this course as my method for doing stranded work is anything but traditional and since our organization keeps traditions alive I felt it would be a problem but I have had many requests for this information. Most knitters prefer doing stranded work in the round but I like doing it flat for a variety of reasons. Mainly I think the stranding tension is much easier to manage and I don't mind purling. In the course, I suggest trying knitting backwards instead of purling. This way the RS of the work is facing which can make following the chart easier. To knit backwards, don't turn your work when you reach the end of the row. Just insert the left needle in the last stitch BEHIND the right needle and wrap it over the needle from left to right. You then use the right needle to pull the stitch through. The photograph below shows the yarn wrapped properly. Like anything you try for the first time, it can feel weird but if you practice it starts to feel more natural. This also can be something to try if you purl looser than you knit. I'm having salon on Sunday even though it is New Year's Day. It will be from 2-4pm. I did do a lot of knitting for presents but I didn't photograph a single thing! It was mostly hats, scarves, mittens and fingerless mitts. I did think to photograph the hats and mitts I knit for myself. I had several skeins of Sapphire Jade cashmere that I've had forever. I have to say these are pretty yummy. Its been too warm here to wear them but I know that won't last! The transition date is getting closer and closer. The website is progressing along nicely and soon I will be able to start work on loading patterns for the online version of Cast On. I've been getting finished garments from the designers. I just need to find a photographer! Our fundraising is progressing nicely as well. The support of our members is very gratifying. It makes all of this work worth it. I was out of town for a few days early this week and I came back to several lessons. The transition to the new system is not going to change how students order courses except in one way. When the course is ordered online, the student will be able to download the first lesson immediately. In the past, they had to wait until the management company notified me. That could take a few days. This is a better arrangement. As it often happens the tip this week is inspired by projects I am working on. Also, this question often comes up with those working on Level 1 of the Masters program. For the Winter issue of Cast On, I designed a garter stitch shawl that uses two row stripes and I offered to do the sample knitting for one of our designers who has some family issues which were limiting her knitting time. Her design is for a scarf (or cowl) that uses single row stripes with three different yarns. When you work stripes you have to decide whether you want to carry the yarn up the work or if you want to cut it. My rule is to never carry it over more than two rows. Maintaining even tension is very difficult if you carry yarn for more than this. Another issue is the long strands. If the piece is to be seamed, these strands will make the seam very thick. If it is something knit in the round, it is very easy to snag the strands. Even when you are carrying the yarn up just one or two rows, you have to watch your tension. When you start using the yarn you previously dropped, there is a tendency to pull the yarn tightly to snug up the first stitch. If you aren't careful, you also pull stitches from the row previously worked in this color. The photos below show where the yarn has been pulled too tightly. Something else you need to be aware of when carrying yarn for stripes is the effect this has on the appearance of the selvedge. For the garter stitch stripes, two rows are worked in each color. This means that the working yarn always returns to the right side of the work. The yarn is never carried on the left side. If you look carefully at the photograph below, you can see the carried yarn on the left side (this is the WS of the work). It looks different from the right side. For the shawl this is barely noticeable since the yarn is so fine but in a heavier yarn, it would be much more noticeable. Again, I find carrying yarn for more than two rows to be problematic. It is a pain to weave in yarn tails but the final result is generally worth it. Salon will be on Sunday from 1:30-3:20. I wasn't able to have salon last week as Saturday was the first Metropolitan Opera simulcast. I spent 5 hours enjoying Wagner's Tristan and Isolde. Last year I wasn't able to see many of the performances. I plan to change that for this year. Sunday I left for Washington, DC. I finished up the scarf length of the chevron shawl. There was enough yarn to knit both the shawl and the scarf. I like this length as well. It isn't as dramatic but looks pretty good wrapped around the neck. While I was waiting for the scarf yarn to arrive, I started on a project I got the yarn for several years ago. 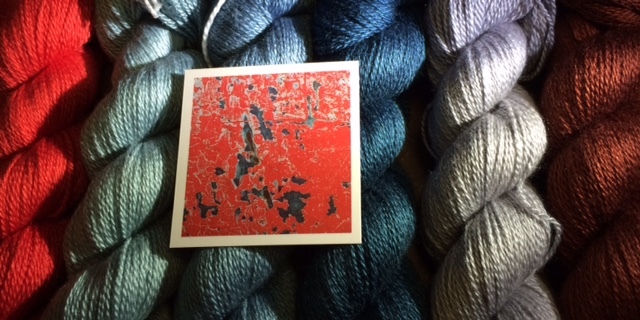 I am going to make a coat from Shibui Linen (for me). I got started on the back. I love that the resulting fabric is so light and slightly see through. Notice how you can see the chair through the fabric. I got started on the scarf. I wound up changing one of the colors from those we originally selected. What can I say? I like grays (and black). I love this pattern. It looks so complex and it is SO SIMPLE. As always, it has been a busy week. Our website is improving day by day. I can't wait until we can do the change. I just found out today our @tkga.org emails can be activated. We started our fundraising. We'd originally planned to do a GoFundMe or something like that but all of those services charge a pretty high fee for collecting the money so our computer guys found us something better that doesn't charge fee Click and Pledge for TKGA. It immediately sends the form for taxes. We haven't really advertised this yet and are getting donation. I've always noticed I get more lessons to review in the fall and this year is no different. I seem to get a new lesson every day. This week's tip was prompted by Binka Schwan, the Vice President of Education for the new TKGA. She has created a new series for Cast On, Skill Builder, which is designed for newer knitters but I think anyone could benefit from this series. It will be accompanied by the Confident Beginner patterns. Her first design is a chunky scarf with optional pockets. She sent me the pattern which had lengthy instructions for seaming the pockets. I offered to do a video for the technique. Well, I spent quite a bit of time on this yesterday. I tend to think I've seen almost everything but I'd not run across this technique before and I found written directions confusing. This was not Binka's fault. It is just something very hard to describe with words. The pockets for the scarf are folder over and then seamed. I assumed it was some sort of running or back stitch and I couldn't force Binka's instruction to do what I thought they should do. She pointed me in the right direction...The Principles of Knitting by June Hemmons Hiatt. If you haven't encountered this book before, prepare yourself. There is pretty much nothing you can do in knitting that she doesn't cover. Unfortunately, the names she gives things are not found anywhere else which makes it difficult to use. For example, she calls the mattress stitch the running stitch and if you've embroidered or done hand sewing, the running stitch doesn't have much in common with the mattress stitch. Anyway, this is a technique Hiatt calls Selvedge Seam. It is used when you want the selvedges stitches to be on the outside of the piece rather than on the inside as they would be if you used mattress stitch. I have never used this before. She recommends using is when seaming garments with bulky yarns. I can't see myself doing this. Selvedge stitches are ugly so why would you want them on the outside? The other use fits perfectly for Binka's project. If you have slipped the first stitch of every row you get a decorative chain and you can use the selvedge seams to join the two pieces and the seam can be decorative. 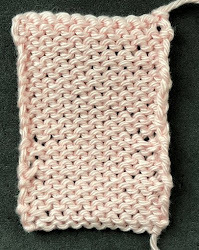 The photo shows a swatch I knit it up (NOT BINKA'S pattern) . When you use the mattress stitch technique you have the two pieces side by side and when you pull the seaming thread tight, the selvedge is turned to the inside of the piece. With this technique the two pieces you are seaming are on top of each other. I was making this much more difficult than it is when a light went off and I realized that the procedure is worked just like the mattress stitch but from top to bottom rather from side to side. This photo shows the seam from the side so you can see the path of the yarn. I finished the shawl, blocked it and wove in the ends. Here it is wrapped around. And how it looks from the back. I also finished up vest. It is a reworking of something I did for Cast On in 2009. Many knitters used that pattern for Level 2 of the Masters and there were several things wrong with it for that purpose. I changed it. I haven't done the final finishing yet. Now I'm working on a scarf version of the shawl. I'm almost done. It has been a rough couple of weeks. It is a lot of work starting an organization from scratch. Things are going very well and I think our members are going to be pleased with the new website. I've been working on the Winter issue of Cast On and it hasn't been easy. First of all, there are no funds to pay designers for their work. I didn't even bother to send out a Call For Designs. I am relying on the fabulous talents and goodwill of our committee members and others. The magazine will be shorter than in the past but we will be in good shape for Spring. We had some devastating new last week that our wonderful photographer, Kyle Baugh, died suddenly. He was only 38 and leaves behind a wife and two daughters. (His wife and oldest daughters are the models for the Fall issue which is at the printer now. ) Kyle had agreed to do the photography for the new TKGA so I am mourning doubly. He will be missed. It must be getting close to fall! I've been getting more lessons to review. Keep them coming! #1 shows a central double decrease. There are a variety of abbreviations for this--CDD, s2k1p or s2k1psso and probably more. They all refer to the same technique. You slip two stitches AS IF YOU ARE GOING TO KNIT THEM TOGETHER, you knit the next stitch and then pass the two stitches over the stitch you just knit. A very common mistake is to slip the two stitches one at a time. If you do this, you get #4. The center stitch should be on top and slipping the two stitches together places the center stich in the correct location. #2 shows a different type double decrease. This is generally abbreviated s1k2togpsso. I am sure there are other ones as well. Every designer seems to use a different one but they all refer to the same decrease. To make this one, you slip one stitch, knit the next two stitches together and then pass the slipped stitch over the stitches you just knit together. I've seen this decrease used a lot in lace when it is a floral design. If you are not careful when making this decrease, it can look a bit sloppy. Single slipped stitches tend to get stretched out so you should be careful with it when passing it over the other stitches. Notice that the center stitch is underneath the stitches to the right and left. #3 shows K3tog. I've rarely seen this used in lace. About the only place I've used it is in itty bitty bobbles. When I did this swatch, I noticed that #4 mirrors this. Good to know if you ever need to mirror a K3tog. The vast majority of patterns call for decreases to be made on the RS of the work (in most projects the knit side) but in rare occasions you may need to know how to make a double decrease on the WS of the work (the purl side) and that decrease needs to look like the ones above. Some patterns don't let you know how to do this. Making #1 on the purlside is a bit tricky. I suggest you look at the video if you have any questions. The first thing to do is to change the orientation of the first two stitches on the needle. To do this, you slip them one at a time and then return them to the left needle. This ensures that the decrease won't be twisted. Next you need to change the orientation of this two stitches AGAIN. To do this you slip the two stitches together as if you are going to purl them through the back and then return them to the left needle. Please look at video to see exactly how to do this. The final step is to purl the 3 stitches together. Making #2 on the purlside is not as difficult. You basically reverse what you do on the RS. Purl the two stitches together, return this stitch to the left needle and then pass over the stitch to the left. To make #3, just purl the three stitches together. Salon will be on Sunday, August 21, from 1:30-3:20. I've been working on a chevron shawl using some RedFish silk I bought years ago. I'm going to do a multicolor chevron for the winter issue of Cast On using these colors. Elff has put together some wonderful color packets. I'll do it in 3-ply so I can use larger needles. I'm using 2.25 for the blue one. I'll have to put it aside soon. It has been a busy couple of weeks. Starting an organization from the ground up takes a lot of work. We have a great board and we have divided up the necessary tasks. Christina and Mary Beth have great business skills. It looks like our non-profit status will come through by the beginning of next month. That will be a relief as we can start fund raising. Our main expense is going to be a website and computer system that actually works. Anyone who has tried to navigate TKGA.com will tell you that this is much needed. I'm working on the next issue of Cast On. The first issue will have to be small due to the financial realities. Designers do expect to be paid so I imagine we will have mostly "donated" designs. I've got several in mind. The good news is that we can make the organization what it should be -- for serious knitters, by serious knitters. I've had more lessons to review that I expected. Summer is generally a slow time. Again, nothing is going to change for the correspondence courses. I like to remind my students that I do not enforce a time limit but this is NOT the case for the other courses. The deadline is a year. I used double increases for the skirt part of the dress I just finished (see below) and I started to think of the ways to work double increases. Also whenever I teach eyelet/yarnover buttonholes, dealing with a double yarnover always causes problems. I decided to group them all together. Double yarnovers can be used to create a double increase. The problem will be that there will be a hole but depending on the project, this might be just fine. This photo shows three ways of dealing with double yarnovers. The first step in working any of these double increases is to make a double yarnover. You don't have to decide what to do until the next row. The examples assume you are working flat so if you make the yarnovers on a RS, you will work them on a WS row. Most instructions for the bottom one state to knit into the first yarnover and then into the back of the next yarnover. I've seen lots of variation on this one. Sometimes you knit the first stitch and then purl the next. It really doesn't matter, the results are similar. This increase is used in the Monkey Socks by Cookie A. (Some of you may remember when this pattern appeared in Knitty. I really didn't like the way the double yarnover looked so I did a variation, the one at the top of the swatch. The next two show a variation where you treat the yarnovers like you would the horizontal strand between two stitches when you make an M1 increase. You can have them all slant int the same direction or you can mirror them as shown in the photograph. The video shows the difference when working them. The hole is smaller with those methods. This type of double increase works well when you have an even number of stitches as you are making them between stitches. The next technique works better when you have an odd number of stitches as the increases are on either side of a stitch. The one labeled A is a central double increase. I've seen this used in lace patterns. The instructions for this one are a bit confusing. You knit into the back of the stitch, then into the front of the stitch, and then you find the vertical strand running up to these two stitches and you lift it onto your needle and then into the back of it. The videos shows this one, if that sounds confusing. It does produce a nice increase, sort of the reverse of the central double decrease. The one labeled B is created by working a right slanting lifted increase on one side of the stitch and a left slanting increase on the other side of the stitch after you've worked the stitch itself. It does leave a bit of a hole. The ones labeled C and D use mirrored M1 increases on either side of a central stitch. If you look close you can see that they are slightly different, depending on the order of M1L and M1R increases. Salon will be on Sunday from 1:30-3:20. See you then! Yes, I finished it. It hasn't be blocked yet. I'm waiting for a day without rain in the forecast. I can't say this was fun to knit but I am looking forward to wearing it. Yes, this is for me and No, I am not writing a pattern for it. A lot has happened since my last post. Between taking a quick vacation over the 4th to preparing for the conference in Charleston, I just didn't have time to make an entry. The conference went very well and at Masters Day we made an announcement that the management company which owned TKGA was dissolving the entity. They were willing to give the Masters Committee the organization and its property. We agreed to take this on and to transform it to a 501c3 non-profit. Here is a link to the announcement which we posted in Ravelry as well as Facebook, etc. The response has been positive for the most part. There have been a few complaints which I am handling individually. If you'e like to put in your two cents, the last line of the announcement has an email I am using for that purpose. The high point of the conference is always when we pin the new Master Knitters. We took the opportunity to get a photograph of the Master Knitters who were in attendance. The Yarn Tasting went very well. I think I was forgiven for not doing goody bags. After all, I did wind 3,300 center pull balls. We displayed four of Charles Gandy's wonderful art instalations. I'm thrilled Shoeshi came home with me. Here is the photo I took at the show at the Bascom Museum. I just have to find the perfect place for it. I want to reassure my students that the reorganization will not effect them in any way. You can continue to order the classes and I will continue to review them as always. One of the things I love about teaching is that I always learn something. One of the students in my Finishing Class, Patti Giorgi, showed me a different way to do Kitchener Stitch. With Kitcheners Stitch, like a lot of knitters, I finally mastered one way to do it and wasn't all that interested in investigating different methods. Patti found this technique in a video which she hasn't been able to find again or we would give that person credit. I have to admit, Patti showed me this at the end of a very long day of teaching 25 students and I knew I had to go right from class to set up the Yarn Tasting so I wasn't all that enthusiastic about learning it . After a good night's sleep, I was ready to give it a try. Rather than use a tapestry needle, you "knit" or "purl" the seaming thread through the stitches. The main advantage of this method is that you don't have to mess with the seaming yarn as much to get those stitches to match the surrounding stitches...this is a BIG advantage. Patti swears you can also read the work to see what comes next but I haven't reached that state yet. I have done a blog entry on the technique using a tapestry needle, Kitchener Stitch with Tapestry Needle, if you want to compare the methods. --Cut a strand of yarn at least three times longer than the edge you will seam. --Insert knitting needle knitwise into the first stitch on Needle 1 and pull the seaming yarn through the stitch. Insert knitting needle purlwise into the first stitch on Needle 2 and pull the seaming yarn through the stitch. Once you have taken care of the selvedge stitches you are ready to do the rest of the stitches. Take care not to pull the yarn through too tightly! "Purl" the first stitch on Needle 1 and pull the yarn through. Drop this stitch from the needle. "Knit" the next stitch on Needle 1 and pull the yarn through. "Knit" the first stitch on Needle 2 and pull the yarn through. Drop this stitch from the needle. "Purl" the next stitch on Needle 2 and pull the yarn through. Repeat these steps until only the selvedge stitches remain. To finish "purl" the last stitch on Needle 1 and pull the yarn through. Drop the stitch. "Knit" the last stitch on Needle 2. Pull the yarn through and drop the stitch. The dark blue yarn is the seaming yarn. This required very little touch up when the kitchener was complete. Salon will be on Saturday from 1:30 to 3:20. I generally have salon on Sunday but this week Anzula is doing a truck show at ReBelle which I do not want to miss! I'm glad they have put Kentucky on there touring schedule. I'm finally getting time to finish my dress. RedFish dyed the yarn for me. I'm using 6 shades of black to gray. If you look close you can see a very subtle change. I'm about tready to change to a slightly lighter shade. I want the sleeves to exactly match the body. This is a bit of a pain. Sorry I didn't post last week. Sometimes life just gets in the way... More yarn keeps arriving for the Yarn Tasting. I am seriously behind! I am getting some great yarn for the door prizes. I am showing restraint from adding to my stash! Just a reminder...I don't enforce the one year time limit for completion. As long as you ordered the course from me, just send me an email to let me know you want updated materials. If you have the current materials (April 2014) just send in the lesson, no need to email me. Some contacted me who was having difficulty with a tubular bind off in the round. I just happen to be working on a sweater which is knit top down where I bound off the bottom and cuffs to match the tubular cast on for the turtle neck. I really like the looks of a tubular bind off. If I am doing a project which will be enhanced by a stretchy cast on/bind off, I always chose to do one. I do them often enough that I don't have to look up how to do one anymore! I find it much easier to do the bind off on K1P1 ribbing that K2P2 ribbing (yes, I know you can do it but I just prefer the look of the K1P1 ribbing) so I convert K2P2 ribbing to K1P1 ribbing. I did a blog entry on this a long time ago. Here is the link: K2P2 to K1P1. The next step of the bind off is to do at least two rows/rounds where you alternate slipping stitches with the yarn in the front or back depending on whether it is a knit or a purl. When you are working in the round, you will work one round where you slip the purl stitches with the yarn in the front and on the next round it will be the knit stitches with the yarn in the back. For the cuffs I did four rounds. Insert the tapestry needle PURLWISE into the first stitch on the left needle. (It is a purl stitch...see above.) Pull the yarn tight. Insert the tapestry needle PURLWISE into the knit stitch to the right of the purl stitch, across the purl stitch and into the knit stitch to the left of the purl stitch. Pull the yarn tight. Insert the tapestry needle knitwise into the first stitch and pull the yarn tight. Drop the purl stitch and knit stitch from the needle. Repeat these steps until all stitches are worked. Here are links to the videos. The first one shows how to begin. The second one shows how to end. I finally finished the sweater for Elff. Finishing took quite some time... the yarn is dark and there were lots of rows. I had to get out my OTT light! Elff says she like it and will wear it to shows. If RedFish Dyeworks is at a show, check it out, particularly the inside. My stranding is very good, if I say so myself. I then knit my first yoked sweater. I'd never done one before. I redid the first section of increases about four times but I liked the final version. Here is the front. I wanted the cables to extend a bit further on the back so the back is different. The cables extend even further on the sleeves. You can't really see them in the photograph. I am going to have to steam the center cables on them before the photo shoot. Now I am working on a coat. I'll have photos next week.